CEO videos in Annual Reports - nexxar lab. Potential of CEO videos in Annual Reports. Companies and their executive boards are increasingly taking advantage of the potential of moving images. According to a WeberShandwick study, today the CEOs of more than half of the top 50 Fortune Global 500 companies appear in corporate videos. More and more often you will find CEO statements also in online annual reports – for a good reason. By making use of CEO videos, companies are able to better introduce themselves to internal and external stakeholders. Who leads our group? What do we stand for? What are our strategic goals and how do we want to achieve them? These and other questions can be answered or at least addressed by the board in a video statement. 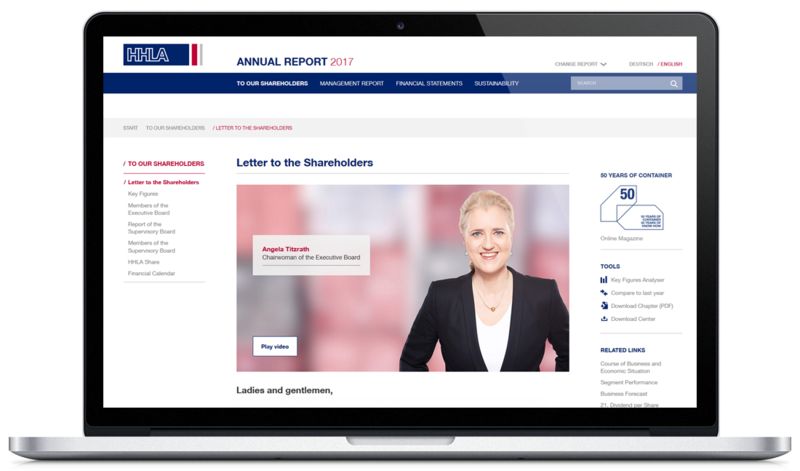 The multimedia presence of the CEO in the annual report will help to convey the character of a company and also add a more personal touch and authenticity to the classic board letter. The CEO becomes “tangible” and even large corporations are no longer faceless or anonymous. Numerous studies show how important a strong appearance is – both internally and externally. Stakeholders associate CEOs directly with the business success of a company. In times of crisis, CEOs with a good reputation are given more confidence. Also, the acquisition of shares is decided by many shareholders – among other factors – based on the image of the top management. Furthermore, CEO videos are a statement of appreciation for an annual report and its readers. No photo or board letter could ever address stakeholders with such a personal touch and the possibilities for the digital distribution are far bigger with the use of videos. Needless to say, a CEO video should be implemented not only in the online annual report, but also on the corporate website, on the intranet and on YouTube, Facebook & Co. However, the different platforms have to be taken into consideration before producing the video. In general, CEO videos in online financial reports should be as focused as possible (what’s the key message?) and should not be significantly longer than 2 minutes. This year we produced a CEO statement for the Hamburger Hafen und Logistik AG (HHLA) annual report. A few years back, the port and transport logistics group set a new focus on digital reporting. The report content is primarily conceived for the display and use on screen. You will see this on the landing page with a dynamic video loop in the background, in the online-only magazine section as well as in the way HHLA presents typical reporting issues (e.g. the materiality analysis) in a digital manner. Another part of this digital reporting approach is the new CEO video statement. In about two minutes Angela Titzrath, Chairwoman of the Executive Board, sums up the financial year 2017 in a personal message to the shareholders. The video is a mixture of interview passages filmed in the HHLA headquarters combined with footage material from the port of Hamburg. Accompanying key figure animations support the video message and direct the viewer’s focus to the most relevant developments of the HHLA financial year. Time is an issue: In most cases, you will not have more than 30 minutes of actual shooting time with the CEO. This will suffice to shoot maximum 3 to 4 takes, which will offer you quite a bit of useful material, if you invest enough time in the preparations beforehand. The more time you invest in advance to take every last detail into consideration – including concept, script, location, equipment, sound and video setting, outfit and make-up – the better results you will get. Location check: The success of a video shoot depends very much on the chosen location and the local (light) conditions. Whether the video shoot takes place indoors or outdoors, whether you have natural or artificial light is relevant information that will influence your planning (e.g. equipment). So, do your research: How is the light at the time of day when the video shoot is planned? What could be possible disturbances, e.g. for the sound? Are there enough power sources? etc. Before deciding on the location, make sure to see it, even if only on photographs. Finally, make sure to arrive some time ahead of the video shoot to build up the setting and properly test the light and sound conditions. Keep your audience’s attention: Try to make the message as much to-the-point as possible. It is best if the CEO video doesn’t exceed 2.0 minutes in length. Know your format: Before creating a video, think about where and how to use it later, e.g. will the video also be shared as a report teaser on Facebook? This would result in different requirements for the design, as different output formats may be needed. Find the right place: Apart from the CEO letter, be sure to place the CEO video also on the report’s landing page, where it will get a lot of attention. On 31 August 2018, nexxar will be hosting the second Round Table on digital reporting in Vienna. Along with reporting specialists from international companies we will dedicate a full day to discussing a variety of topics around the future of digital reporting. One of our workshops will focus on CEO videos. In the hands-on workshop, you will learn how good preparation can result in a professional CEO video statement for the year, with only 20 minutes of actual shooting time.